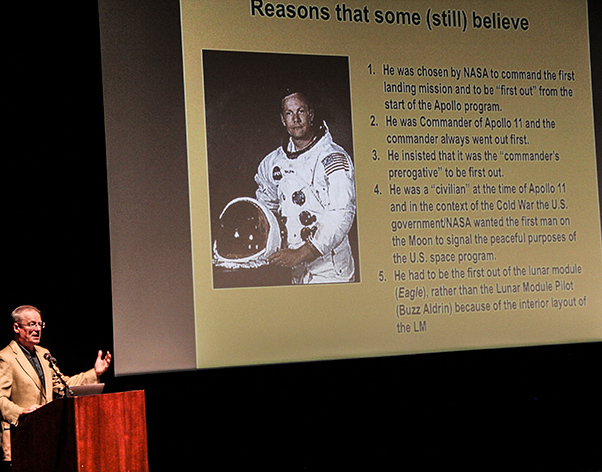 Dr. James Hansen spoke at the Antelope Valley College Theatre as part of the NASA Armstrong Flight Research Center’s Colloquium series and discussed why Neil Armstrong was the first man on the moon. His book, “First Man — The Life of Neil A. Armstrong” (Simon & Schuster, 2005, 2012) is the only authorized biography of Neil Armstrong, first man on the moon. The book spent three weeks as a New York Times Bestseller and garnered major book awards including the AIAA’s Eugene E. Emme Astronautical Prize, American Institute of Aeronautics and Astronautics’ Gardner-Lasser Literature Award, and CHOICE magazine’s Outstanding Academic Book. The book is being made into a film by Universal Studios and Amblin Entertainment. Dr. James Hansen, author of Neil Armstrong’s biography “First Man — The Life of Neil A. Armstrong,” spoke at the Antelope Valley College Theatre as part of the NASA Armstrong Flight Research Center’s Colloquium series and discussed why Armstrong was the first man on the moon. “Most people know about Neil Armstrong as being the first man on the moon. A few people know about his history as a research test pilot for NACA and NASA, but not many people know that he used to be a resident right here in Lancaster on the east side, at 50th and L,” explained David McBride, director of NASA’s Armstrong Flight Research Center at Edwards Air Force Base, before he introduced Hansen. According to Hansen, Armstrong was an All-American boy born in Wapakoneta, Ohio, who liked to build model airplanes and test them by having his siblings fly them out of a second story window. He would watch and observe from the ground, adjusting the model after each flight. Armstrong received his pilot’s license before his driver’s license and earned an aeronautical engineering degree from Purdue University following his Navy service. As a research pilot at NASA’s Flight Research Center at Edwards, he was a project pilot on many pioneering high speed aircraft, including the X-15a high speed (4,000-mph), high altitude rocket plane. That experience was unique and meant Armstrong was the only astronaut in his class with prior rocket-powered flight experience. He was constantly focused on preparing for what could go wrong, and flew more than 200 different models of aircraft during his career. “He was born at the right time in history,” said Hansen. 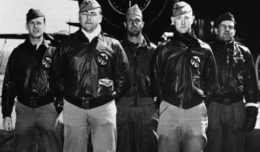 He was too young to serve in World War II, but served in the Korean War as a Navy pilot. Cmdr. Deke Slayton, a Mercury 7 astronaut who became head of NASA’s astronaut office and was in charge of assembling the crew for various space missions, picked the best believing that any of the astronauts could perform any mission. For Apollo 11, Slayton chose Neil Armstrong, Buzz Aldrin and Michael Collins. Hansen said there is more to the story than position on the crew rotation that singled out Armstrong as the choice to exit the Lunar Module first. NASA officials understood that whoever first set foot on the moon would instantly become world famous and an historical icon. Officials discussed whether Armstrong or Aldrin would be the better choice. They were both excellent at their jobs — however, Aldrin was known to be quite a partier.